Do you know "what's what" with the DIY terms upcycle vs. repurpose? I see these words used interchangeably over and over again, and often in the wrong context. So I thought I would share a quick lesson to help you distinguish your own DIY projects. Upcycle, in very simple terms, is taking something and making it better. It's the reuse of an item that will still be used in the same way - but it looks new and improved. 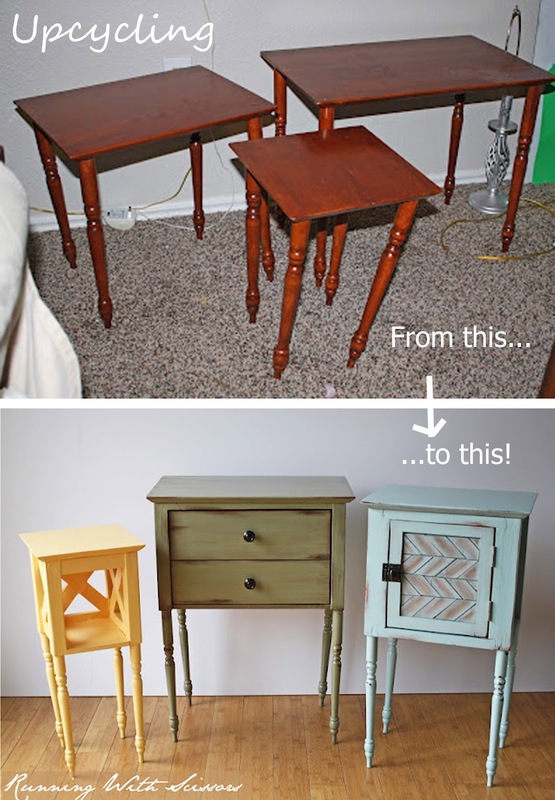 Upcycling can be achieved through paint, add-ons, new upholstery, etc. Here's a great example with upcycled side tables from Running with Scissors (includes a tutorial). Repurpose, quite simply, is taking one thing and reusing it as something else. 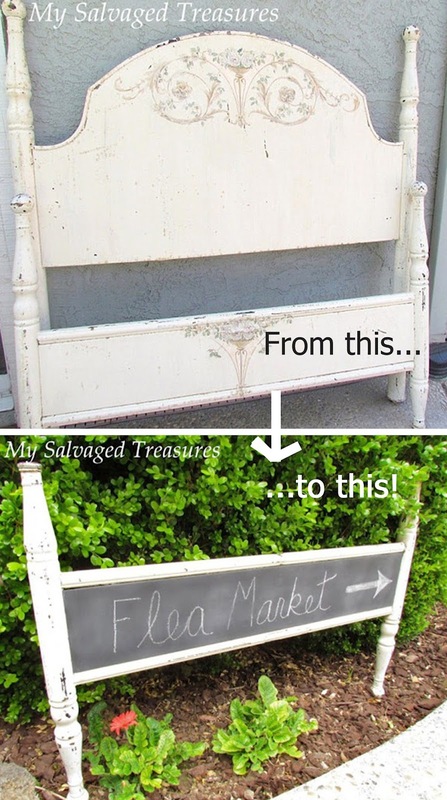 Like this fun example below of a footboard repurposed as a chalkboard sign from My Salvaged Treasures. And guess what? Both of these examples are Recycled - which simply means that they aren't ending up in a landfill somewhere on the planet. They have been given a second life and another chance to be loved again. Hope that helps! So what is your current project? Upcycled or repurposed? Not always, but certainly in the examples above. I'm a sucker for quick projects and shortcuts, so the examples I gave as upcycled probably wouldn't make it to my 'to do' list. Thank you! It does get confusing, as different people use different terms. I am now confident calling my charity shop jackets - upcycled - they are still jackets..... or maybe waistcoats, but still clothing. Joelle - where can we see your jackets? I want to see the jackets too! :) Great blog Blue. Love turning trash to treasure. Thank you so much for setting that out so simply, when it can be simply confusing! You're welcome! I've been meaning to do it for quite a while...but it always slipped away. Now I can check that off my mental to do list. When is the reveal for the new way to use it? That's a great explanation - thank you. The transformation of the three top tables is incredible. I tried to define these terms too, as well as "refashion" and "reclaim." 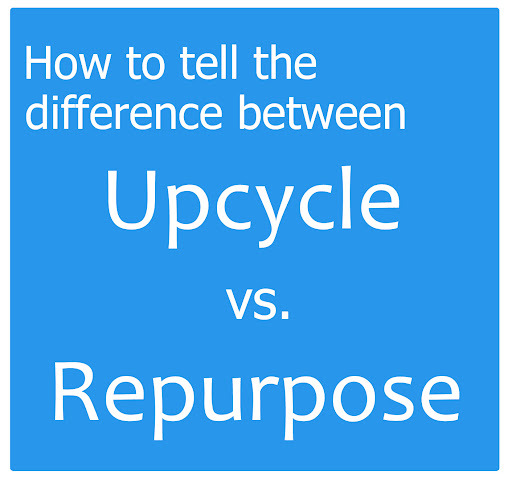 I think I agree with the commenter above that "upcycle" implies you're starting with something usually considered trash.